While executions by state authority were legal in Kansas from 1861-1907, the State Legislature imposed tighter regulations on the process with Senate Bill 18 (1872). The act provided the time of execution to be ordered by the governor and required the Governor's Office keep records of all death sentences and copies of all death warrants. In 1876, the Osborne County District Court convicted Henrietta Cook of first degree murder and sentenced her to death by hanging. 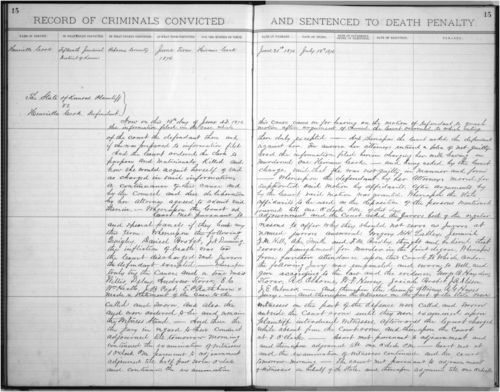 This entry from the governor's record of death sentences includes transcripts of the criminal docket, verdict, and order to the county sheriff. Kansas governors between 1872-1907 refused to issue execution orders, as required by law, effectively banning state authorized executions during that period. Though Kansas has never executed a woman, several women have been sentenced to death in Kansas.